A major new edition of the trusted, bestselling, comprehensive Oxford School Dictionary with new curriculum support. This fantastic new edition will boost your children's vocabulary with new words and meanings from across the curriculum. A helpful new spelling, grammar and punctuation section is included to enhance language skills and bring the dictionary right up to date. What makes it the best? It is uniquely powered by the Oxford Children's Corpus, the largest bank of children's language in English, so you can be confident that all entries are clearly written in child-friendly language that children actually understand. Each example is perfectly age-appropriate, making it easy and enjoyable for every child to use. New for this edition is a robust supplement on spelling, grammar and punctuation, giving targeted help with the tricky bits, making this dictionarythe perfect tool to support children in their journey to become good readers and writers. 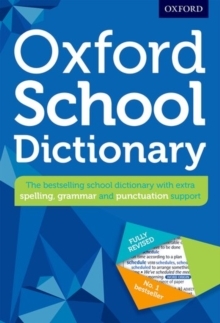 As usual, it has been extensively trialled with schools, so you can be sure it is still the best dictionary for your children, in a durable hardback format. Further help with writing skills is available in theupdated new edition of the companion Oxford School Thesaurus. Looking for great word activities to match this dictionary?